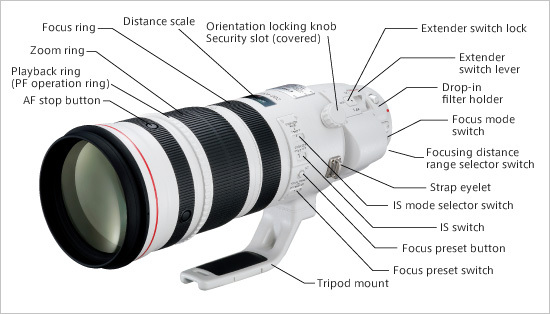 The Japanese photography blog Egami uncovered a new Canon patent for an EF 400mm f/2.8L IS USM Extender Lens. It appears the new patent describes a lens with a selectable 1.4x and 1.7x extender, built-in, giving the lens a maximum aperture of f/4 and perhaps f/5 and focal lengths of 560mm and 680mm, with extenders deployed, respectively. Canon announced the EF 200-400mm f/4L IS 1.4x Extender lens back in 2014. This is one of the favorite Super Telephoto lens in my equipment bag. You can read my review by clicking on the above link and see my works on MichaelDanielHo.com. If Canon decides to release this new lens, I may be interested if it does not weigh more than the current EF 200-400mm glass (just below 8 pounds) but the two lens I am most eager to acquire are the EF 200-600mm f/4.5-5.6 IS Super Zoom and EF 600mm f/4 DO BR, showcased in the Canon Expo Show in 2015.